Romney’s campaign has yet to release a lot of damning information about the GOP candidate’s tax returns. Barack Obama did a nice job of debunking Mitt Romney’s plan to cut taxes for the wealthy in the second presidential debate. He also pointed out that Romney, according to his tax estimate for 2011, paid a “lower tax rate than a nurse or a bus driver.” But Obama failed to make another significant point: Romney has still not released many crucial details about his tax returns. The media have stopped pressing Romney for more information about his tax history, which is unfortunate, since there’s still a lot we don’t know. The 2010 tax return Romney released in January, which showed that he paid a rate of 13.9 percent in income taxes, did not provide details about his offshore accounts in places like Switzerland, Bermuda and the Cayman Islands. (In his 2011 tax returns, where he claimed to pay a rate of 15.4 percent, Romney did not check the box indicating he had any foreign accounts.) And he released only a brief summary of his taxes from 1990 to 2009, when he claims to have paid an average of 20.2 percent in federal income taxes. 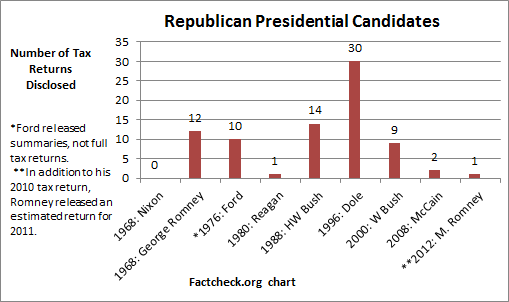 It’s true that in the 2008 election, Republican nominee McCain released just two years of tax returns. But you have to go back more than 30 years—to President Ronald Reagan, who released one year’s return in 1980—to get to a major party nominee who released less than five years of tax returns. 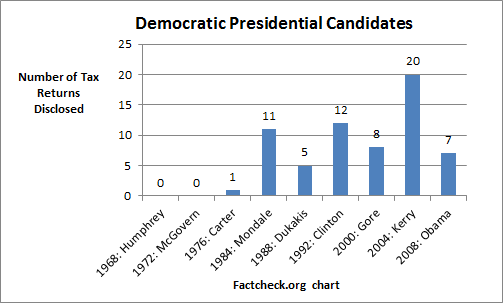 Then there’s the manipulation of his tax returns from 1990–2009. “We know almost nothing about them and they’re completely misleading,” Wilkins said. “The way PricewaterhouseCoopers computed the average rate was a total joke.” The accounting firm took the rate from each year without accounting for how much Romney made in a given year. For example, if Romney paid 35 percent in taxes on $250,000 in income one year and 15 percent in taxes on $50 million another year, his weighted average “is going to be a lot lower than what he reported—closer to 15 percent,” Wilkins said. Wilkins points to a few pieces of damning suggestive evidence. “In the early nineties, Romney made the decision at Bain Capital to move funds to the Cayman Islands to attract investors who didn’t want to pay taxes,” said Wilkins. Romney said in August that “big business is doing fine in many places” by exploiting “low tax havens around the world for their businesses.” Romney, evidently, has done the same. Romney has investments in a number of well known tax havens, including Ireland, Luxembourg, the Cayman Islands, and Bermuda. Until 2010, he held a few million in the Swiss bank UBS, which in 2009 was forced to pay the US $780 million in fines and penalties for helping more than 17,000 Americans commit tax fraud by hiding as much as $20 billion overseas. The total value of Romney’s offshore investments is unknown, but his tax returns have revealed that he has at least $30 million invested in the Cayman Islands, in at least 12 different Bain Capital funds. Under Romney and Ryan’s tax plans, people making over $1 million would get an average tax cut of between $250,000 to $400,000 a year, according to Citizens for Tax Justice. Romney can only pay for that massive tax cut for the wealthy by exploding the deficit, like George W. Bush did, or by drastically cutting the social safety net, as Ryan has proposed to do. Either policy would be unpopular, which is why Romney has released so few details about how he’d pay for his tax cuts. Romney’s tax history gives us a clue as to how he would govern—and that’s why the candidate wants to leave us in the dark.